The forest proves an effective cover as you watch the abductors bring forth the captive. A safe return earns a high prize, so you move with care. You take the rogues unaware, your lower limbs clad in the Mercenary Leather Greaves. The 9-10 oz. leather reinforces your protection on the LARP battleground. Nickel plated -antique brass for the brown- rivets and flared edging enhances your fierce warrior style. The back of each greave includes two buckle straps for secure adjustment and comfort. 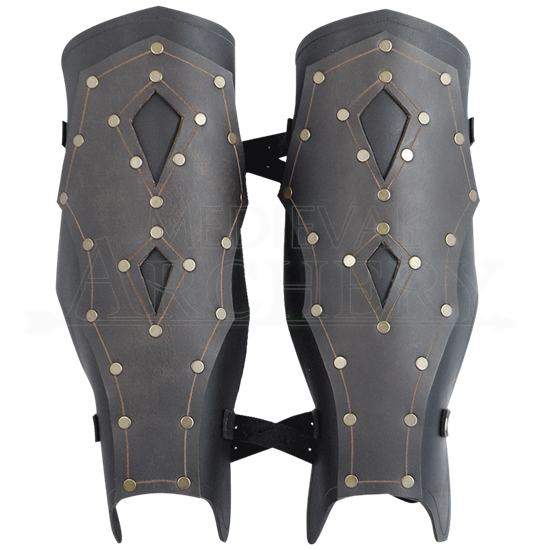 Complete a perfect look and defense by combining these greaves with the Mercenary Leather Bracers and Mercenary Leather Cuirass. Brown/tan colour looks great with the assasins armour in all the pictures. It’s a good quality leather as well.